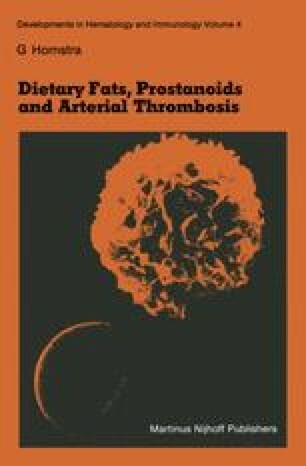 From the previous chapters it can be concluded that the type of dietary fat significantly affects arterial thrombosis tendency in rats, most probably via a change in platelet aggregability. The dietary fat type also influences platelet thromboxane A2 (TxA2) and vascular prostacyclin (prostaglandin I2, PGI2) production in a strikingly similar way: although the amounts of the different compounds produced were greatly affected by the type of dietary fat, the ratio between both products remained the same. This suggests that the type of dietary fat affects a common factor, which is as important for TxA2- as it is for PGI2-formation.